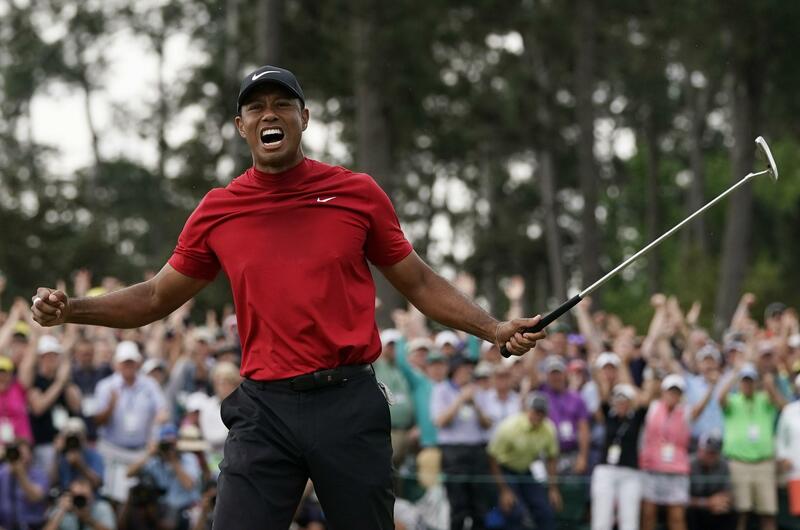 UPDATED: Sun., April 14, 2019, 9:40 p.m.
AUGUSTA, Ga. – Tiger Woods blazing to victory in his Sunday red at the Masters, a scene once so familiar, was never more stunning. And now it’s all pieced back together – his life, his back, even golf. It had been 14 years since he last won the Masters – no one had ever gone that long between green jackets. He had gone nearly 11 years since his last major, the 2008 U.S. Open at Torrey Pines on a shattered left leg. “WOOOOOOO!! !” Woods screamed as he headed for the scoring room with chants of “Tiger! Tiger! Tiger!” He had never hugged more people, everyone in his camp who stood by him through a public divorce, an embarrassing mug shot from his DUI arrest when he took a bad mix of painkillers and the four back surgeries, the most recent to fuse his lower spine. Woods now is three short of the gold standard – 18 majors – set by Nicklaus. Published: April 14, 2019, 6:33 p.m. Updated: April 14, 2019, 9:40 p.m.